MELBOURNE, Australia — England cricket coach Trevor Bayliss has dismissed as a "beat-up" any suggestions his team had illegally tampered with the ball after the umpires in the fourth Ashes test with Australia spoke to both teams about their treatment of the new ball. A Cricket Australia spokesman confirmed on Friday that both teams had been spoken to about their practice of throwing the ball into the ground— a legal but frowned-upon ploy to remove some of the shine off new balls and allow them to swing in the air. But there was no suggestion the teams had broken any rules so no action would be taken by the match referee Ranjan Madugalle. "It's a beat-up," England coach Trevor Bayliss said. "As soon as I saw the headlines I raced into the umpires and that was their words. Nothing to worry about, it was a beat-up, absolutely fine. The umpires spoke to both teams about throwing the ball into the rough areas but every team in the world does it." 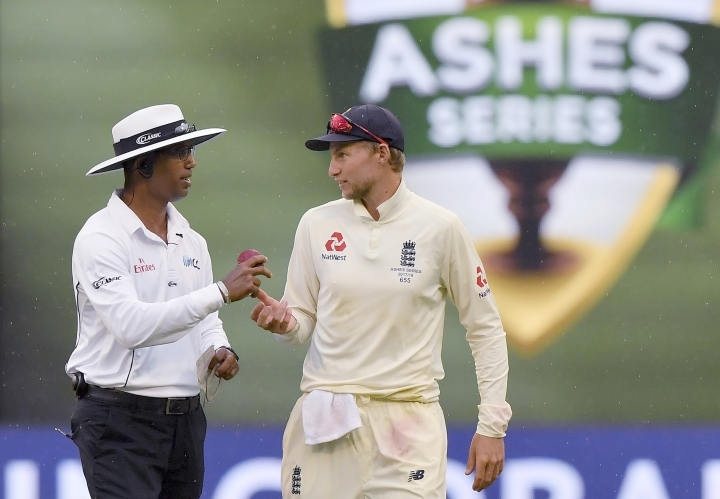 It became an issue at the Melbourne Cricket Ground on Friday after the umpires, Sundaram Ravi and Kumar Dharmasena, spoke to England captain Joe Root and fast bowler Jimmy Anderson, and Australian television repeatedly showed footage of Anderson cleaning the seam on the ball. Ball tampering is not allowed in cricket and Bayliss said there was never any suggestion Anderson had broken any rules. "I went to the umpires and there is no problem from their point of view. You are allowed to clean the ball and they don't see any problem whatsoever," Bayliss said. "I spoke to Kumar Dharmasena and he said to me that with a bit of rain out there, there was some mud on the ball and you are allowed to clean the ball. He said that is fine, just do it in front of me which he (Anderson) was." Australian allrounder Mitch Marsh also said neither team had done anything wrong. "I don't really think teams have been throwing the ball into the pitch inappropriately," Marsh said.